Congratulations to Major Bijayant Sherchan MBE (Gurkha Staff and Personnel Support Company) who was awarded the MBE on the new Year Honours List. He completes a 35-year career in which he has been the epitome of self-sacrifice and utter devotion to the Brigade of Gurkhas. He has been personally responsible for a range of major outcomes during his long and distinguished career in the Brigade both as a clerk and as a staff officer. As the first head of the newly formed Gurkha Staff and Personal Support, his wisdom and energy, along with painstaking investment in his people, instilled an ethos, spirit and purpose for this newly formed, disparately deployed group of staff. Through his boundless imagination and hard graft, he has created a new tightly bonded team unified behind their new cap badge and with a very strong esprit de corps. 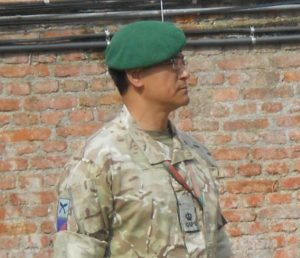 As Deputy Chief of Staff Headquarters Brigade of Gurkhas over an extended period, he takes sole responsibility for the embedding of new Gurkha TACOS through careful and patient negotiation with Army Secretariat, Gurkha units and the Army branches. His personal and painstaking investment has set the Brigade on a solid foundation for the future. Concurrently he has spent time and effort enhancing the vital links with Nepal through his careful and sensitive interaction with policy staff in Kathmandu. This has ensured that the excellent performances of the Brigade of Gurkhas are recognised fully in Nepal and has helped reinforce the United Kingdom’s ability to continue to recruit Gurkha recruits. Major Sherchan takes singular responsibility for the careful management of four tranches of Gurkha redundancy with over 900 non-volunteers successfully transitioning. This was a monumental task demanding; numerous visits to Gurkha soldiers around the world to prepare them for transition, guidance and feedback after each tranche, careful negotiations with the UK Home Office for Immigration and Settlement issues; and individual case work that ensured each redundee received his singular attention and support. That there were no issues or failures during this convoluted and challenging period is testament to his total commitment and utmost professionalism. He has been the model of moral courage in the face of ex-Gurkha protests that became personally aimed at him and his family. In the face of this, he stood resolute and, in order to satisfy an outcome to the satisfaction of Ministers, he spent much of his own personal time monitoring, interacting and advising on this issue of strategic and international proportions. Throughout he remained utterly loyal to the Crown, unperturbed by personal attacks and the epitome of integrity. Latterly, as a staff officer in Nepal, he held together the staff and families through the ‘annus horribilis’ of 2015; Nepal earthquakes and national fuel strikes. A beacon of steadfastness and dynamism, his leadership drew praise from all levels from 3 star down. We owe this officer, on whom we have relied disproportionately, the reward of national recognition for a career on which he has always put his people and the Brigade first, most definitely at the expense of his family and his own career development. In everything asked of him, he has gone above and beyond that reasonably expected. This submission is supported in the strongest possible terms by the Brigade’s Colonel Commandant and Colonel BG, and recognition would be loudly acclaimed across the spectrum of the Gurkha family.